"A Theory of Human Motivation" and it is still regarded as valid today. There are times when we all ask ourselves what we really want. The answer we get depends on our stage of life, and fundamentally follows Maslow’s hierarchy of needs. We start out in life wanting only the basic needs - food, warmth and shelter. As we grow we learn about safety (often the hard way) and fear, so seek protection and security. These needs are usually satisfied by our parents providing a roof over our head, three meals a day and a good education, so we can continue on our own journey of life. We seek a job that pays sufficiently to replace the basics that mum & dad provided. We seek love from a partner, and/or acceptance via membership of a group (gang, sports or social club, union or professional association) or political party. Human nature (or society via advertising) often dictates that we want more than the basics, safety, security and acceptance. Many of us spend much of our middle stage of life chasing status symbols - promotion to leadership roles, bigger and better cars and houses, and all that goes with them. 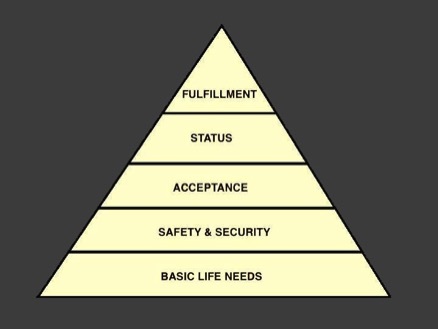 Some people would be satisfied just to have the basics, while others seek status symbols for self-esteem or as a means toward fulfilment (what Maslow refers to as self-actualisation). However, many are simply responding to marketing pressure by individuals or organisations who are pursuing their own status symbols - big sales, profit figures, promotion and wealth. Our governments are still trying to use the taxation system to solve all our problems with growth, productivity and motivation, when it is the system that is the problem. Our political system needs to evolve from tribal politics and politicians must start serving the electorate, not the party, by working together to find simple solutions that will motivate workers and entrepreneurs to have a go. They need to advance to the basic values we were all born with - honesty and trust. We all need to advance to basics.